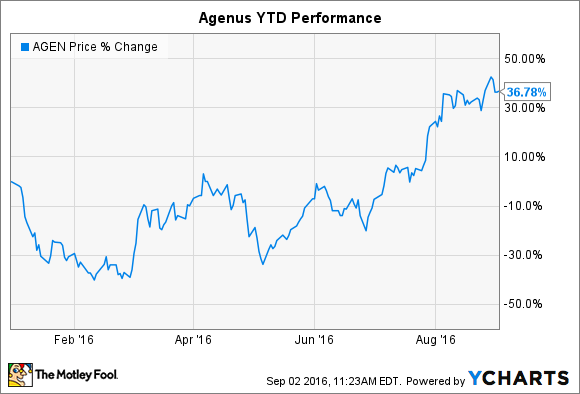 Agenus could be hitting its stride as immunotherapy investments soar in popularity. Despite a few recent setbacks, the enthusiasm for immunotherapy stocks hasn't dampened all that much. Led by an insatiable appetite for therapies based on chimeric antigen receptor T cells, or CAR-T, several biopharmaceutical companies have found it easier than ever to raise money and attract partners. Early results from several programs have been promising, but investors suffering from "Fear Of Missing Out" should know that CAR-T isn't the only play in immunotherapy stocks. One potential opportunity is Agenus (NASDAQ:AGEN), which is focused on "activating the body's own natural immune mechanisms." If that sounds familiar, it should -- it's essentially the exact elevator pitch used for CAR-T therapies. While Agenus isn't working on CAR-T therapies, it has several pipeline immunotherapy programs partnered with Incyte (NASDAQ:INCY) and Merck & Co (NYSE:MRK) that you should know about. Agenus considers itself an immuno-oncology company developing therapies based on cancer vaccines and checkpoint antibodies, although most of the company's value resides in the latter. Research and Development efforts are supported by a unique antibody generation platform that increases discovery throughput, reduces the time from discovery to clinic-ready candidates, and allows for more streamlined manufacturing. The technology platform was acquired in 2014 for just $10 million upfront in stock. What's a checkpoint antibody? Antibodies regulate signals within biochemical pathways involved in disease progression by linking up with specific receptors. There are two types of checkpoint antibodies: checkpoint inhibitors that reduce the output of specific proteins (antagonist) and checkpoint modulators that increase the output of specific proteins (agonist). While there's an alphabet soup of nine different antibody-receptor couplings being investigated at the moment, the two most advanced targets, CTLA-4 and GITR, are in phase 1 trials. The remainder are still being investigated in preclinical settings, but Agenus expects to initiate additional phase 1 trials in the second half of 2016. A program investigating a CTLA-4 antagonist could be a potentially lucrative asset for partners if clinical data prove promising, even though Agenus must pay milestones and royalties to a research institution if successfully developed and commercialized. Tumor cells secrete CTLA-4 to block the activation of T cells and evade the immune system. Therefore, inhibiting CTLA-4 production could potentially allow the immune system to hone in on several types of cancer cells more efficiently. The melanoma drug Yervoy, which had sales of $1.1 billion in 2015 for Bristol-Myers Squibb, is a first-in-class CTLA-4 antagonist. In early 2015 Incyte signed a $410 million agreement with Agenus to access the aforementioned antibody discovery platform. The deal included $25 million in cash upfront, the purchase of $35 million in Agenus stock, and $350 million in potential milestone payments for the successful development and commercialization of a slate of checkpoint antibodies. The most advanced asset in the partnership is being investigated in a phase 1 trial. The GITR agonist could enhance the production of certain types of T cells capable of targeting various cancer cell types, with the current trial investigating effectiveness against solid tumors such as non-small cell lung cancer and melanoma. The company's unique antibody discovery platform has also landed Merck, which recently selected its first checkpoint antibody for an undisclosed indication. The decision triggered a $2 million milestone payment to Agenus. Future developments could trigger up to $98 million in additional milestone payments, while successful commercialization would result in royalties on global sales. Agenus bolstered its cash position with a unique transaction in late 2015, in which it sold rights to 100% of the royalties it would have received from potential sales of two vaccines developed by GlaxoSmithKline. The vaccines -- for shingles and malaria -- each contained an adjuvant product called QS-21 Stimulon developed by Agenus, announced positive phase 3 results in recent years, and are up for approval in certain global regions. But rather than wait for royalty payments to trickle in, Agenus sold the rights to a capital fund in return for $115 million that it needs to advance its more promising, early stage checkpoint antibody programs. The transaction shows up as (non-dilutive) debt on the company's balance sheet, although it can repurchase the loan at any time if there's more upside to the vaccine sales than originally envisioned. However, I wouldn't expect the company to be in a position to do that anytime soon. While potentially lucrative, Agenus' early stage checkpoint antibody pipeline will prove costly to develop. The good news is that partnerships with Incyte and Merck will help to reduce the company's financial burden and have the potential to infuse cash in the form of milestone payments over the next decade. However, the company will need to decide if it wants to shoulder all of the costs associated with mid- and late-stage trials for its promising CTLA-4 antagonist. That depends on results from the current trial, but with about five quarters' worth of cash left in the bank at the end of 2Q 2016, there isn't much breathing room. Agenus isn't quite the partner of choice in immunotherapy, but it has garnered industry attention for its antibody discovery platform. And with a market cap of just $540 million -- a fraction of leading CAR-T stocks -- it could represent considerable upside for investors. It also has a fraction of the cash on hand, which investors need to take into account. Milestone payments may not be enough, or may not be triggered soon enough, for the company to avoid raising dilutive capital by issuing shares. Given the early stages of development for the company's pipeline, I'm going to closely watch how things develop at Agenus in the next several quarters before I consider starting a position.